On Sunday, July 21st , 2013, Riverside Boat Club held the annual Cromwell Cup regatta, hosting athletes of all ages from 33 clubs and 7 states. The Cromwell Cup honors Seymour Cromwell, (1934-1977), a 1964 Olympian and Riverside Boat Club member, and has been run by Riverside members on the Powerhouse Stretch of the Charles River for over 20 years. Though the Charles River is home to numerous collegiate sprint races, as well as the famous Head of the Charles Regatta (held annually the third weekend in October), the Cromwell Cup is the only sprint-length regatta held on the Charles River for youth, club, and adult athletes. The start of the race is near the Weeks Footbridge, and the finish line is 1000m downstream, across from Magazine Beach. In 2013 over 270 boats were entered to win the coveted Cromwell Cup medals—awarded to the first place finisher in each event only. Riverside Boat Club entered 54 boats, and reported victories in the Women’s Open 8+, the Men’s Open 2x, the Junior Men’s 1x, the Men’s Masters 8+, the Men’s Masters 4+, the Men’s Masters 2x, and the Men’s Masters 1x. 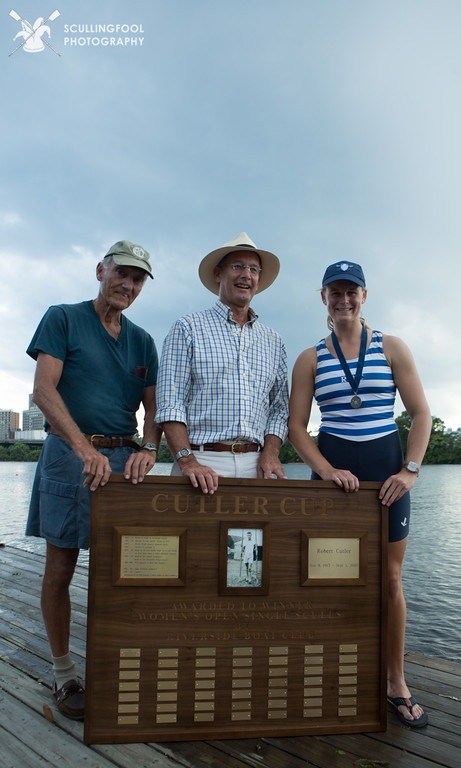 The final notable victory was Riverside’s Kelly Woodacre, who won the inaugural Cutler Cup in the Open Women’s 1x, named in honor of long-time Riverside Member Bob Cutler (1913-2010). Kelly won in a time of 4:10.50, and was presented with her medal by Chris Cutler and Nat Coolidge, Bob’s son and son-in-law, respectively. Bob Cutler rowed at Harvard (class of ’35) before joining Riverside and qualifying for the 1936 Olympics in Berlin. Bob returned to Riverside where he continued to row well in to his eighties. Riverside is the host to numerous rowing programs including men’s and women’s club teams, men’s and women’s pre-elite teams, junior competitive and learn-to-row programs, as well as adult recreational and competitive programs. In addition to Riverside’s regular club members, the building hosts the Brookline High School rowing team and the Simmons College rowing team.